Raymond H. Hua is an experienced civil litigator and trial attorney whose practice focuses on products liability defense, high exposure defense litigation, and business litigation. Mr. Hua has successfully represented Fortune 500 companies in catastrophic injuries and multi-million dollar litigation. He regularly defends automobile manufacturers, automobile components manufacturers, medical device manufacturers, municipalities, water companies, transportation companies, school districts, general contractors, hotels, recreational resorts, medical / healthcare facilities, and numerous other businesses and individuals. Mr. Hua has achieved excellent results for clients in all avenues of civil litigation, including both federal and state courts, and at all stages of litigation from pre-litigation resolution to trial. Mr. Hua's representative experience includes the following: first and second chair trial counsel for cases involving products liability, premises liability, general negligence, and breach of contract; monitoring counsel for excess carriers; local counsel for law firms and clients based out of state; and Federal MDL and California Judicial Council Coordinated Proceeding (“JCCP”) counsel for the defense of automobile components and medical device manufacturers. Mr. Hua’s successes include obtaining defense verdicts at trial; obtaining favorable verdicts and settlements through litigation and trial; obtaining dismissal of cases due to plaintiffs' discovery violations; obtaining dismissals for lack of personal jurisdiction; and securing summary judgment on behalf of his clients. Mr. Hua graduated from the University of California, Los Angeles in 1999 with a BA in psychology and a specialization in business administration. He was awarded multiple scholarships to attend UCLA School of Law, where he earned his JD in 2002. While in law school, Mr. Hua was an editor and business manager of the Asian Pacific American Law Journal. Also, during law school, Mr. Hua was an extern for the Honorable Larry Rubin of the Santa Monica Superior Court, a law clerk for the Federal Commodity Futures Trading Commission, and a law clerk for the general counsel's office of an international corporation based in Southern California. Prior to joining Yukevich | Cavanaugh in March 2006, Mr. Hua's practice focused on aviation litigation defense and business litigation. 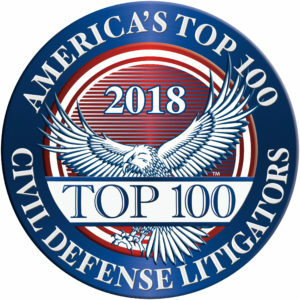 Mr. Hua has been honored as one of America’s Top 100 Civil Defense Litigators, Southern California. This recognition is by invitation only and is reserved for the most exceptional Civil Defense Litigators. Only the top 100 qualifying defense litigators in each state will receive this honor. With these extremely high standards for selection, less than one-half of one percent (0.5%) of active attorneys in the United States receive this distinction. Mr. Hua has been selected as a “Legal Elite” by Corp America Magazine. The Legal Elite stretches across the US, from East to West, from Alaska to Hawaii, and celebrates the skill and dedication of firms, teams and individuals that help and support the legal process. They highlight the most respected lawyers and attorneys as well as their fields of expertise and the companies they represent, and focus on the incredible results that come of commitment and passion in the industry. Mr. Hua is AV Preeminent® rated in products liability, litigation, and commercial law by Martindale Hubble. The rating is the highest rating available for ethical standards and legal ability. Mr. Hua has been recognized as a Super Lawyer by Super Lawyers Magazine and Los Angeles Magazine. The top 5% of all lawyers in the State are selected as Super Lawyers. Prior to being selected for this distinction, Mr. Hua was recognized as a Rising Star. Only 2.5 percent of lawyers in the State are named as Rising Stars. Lawyers must be under age 40 to be eligible for the Rising Star distinction. Multiple-vehicle accident, alleged design defect in restraints system and crashworthiness, plaintiffs alleged neck, spine and rib fractures. Defense verdict. Single-vehicle rollover accident, alleged design defects in roof structure, plaintiff sustained spinal injury resulting in quadriplegia. Defense verdict. Linares v. Crown Equipment Co.
Forklift operator sustained foot/ankle crush injury and claimed forklift was defectively designed. Defense verdict. Garage and vehicle fire alleged to have been caused by a recalled speed control component. Defense verdict. Admitted liability bus accident resulting in fatal injuries to a passenger. Favorable verdict after jury trial. Imaging Advisor, Inc. v. General Plastic Industrial Co., Ltd.